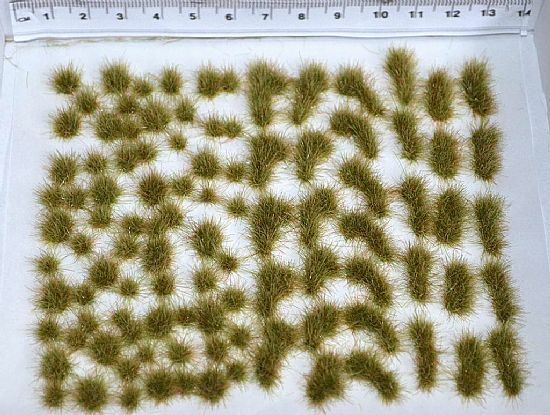 FREE pack of our popular WILD grass tufts to your order. Easy to use - "Self Adhesive Tufts"
No more wet glue around the feet of your carefully made models! 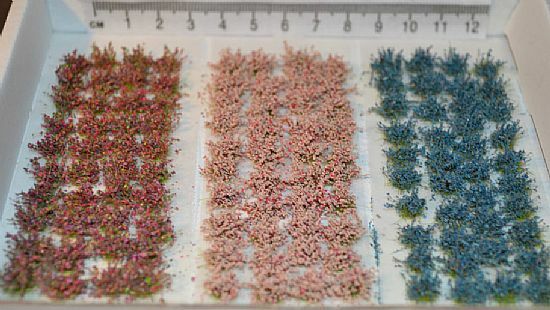 Tajima1 Miniatures have been making innovative self adhesive scenic basing tufts to apply to our own models for years. We hated the mess of loose static grass and the inevitable risks of wet glue and scatter material around a finished model. 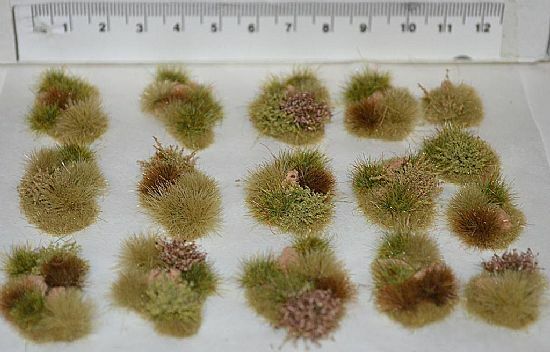 Our tufts have very sticky bases that adhere easily to irregular surfaces. To Apply: Peel from the backing paper with tweezers and place directly onto model with no mess. Range of sizes for all miniatures scales. They are suitable for just about any model making projects including miniatures, railway layouts, wargames terrain and dioramas of all kinds. UK BUYERS ONLY - Shipping is FREE! postage. £3.50 for the first pack and £1 for each additional pack . Non UK buyers must also purchase shipping TOKENS with their order. See shipping terms for full details. 3.50GBP for first pack and £1.00GBP for each additional pack in a simultaneous purchase. NB: Shipping on orders over £75 in value are FREE worldwide! 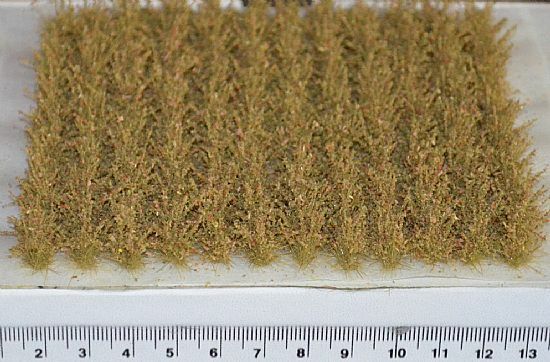 XL Model Gorse bushes. Superb for dioramas etc. Very flexible and highly self adhesive. 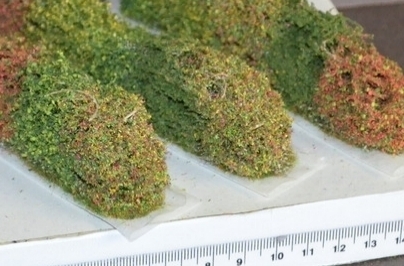 Larger structural pieces than standard bushes with approx height of 2cm and length of 3cm. 3 x Bocage / hedge sections. Highly detailed terrain elements with self adhesive bases. Can be applied directly to a model scene or onto moveable wargames bases. Handmade, so every section is unique. Approx sizes 2cm Height and 10cm Length, Width 1.5cm. 3 x Bocage / hedge sections. Highly detailed terrain elements with self adhesive bases. Can be applied directly to a model scene or onto moveable wargames bases. Handmade, so every section is unique. Approx sizes 3cm Height and 12cm Length, Width 2.5cm. Self adhesive diorama elements.These work on the same principle as all our tufts, peeled from the backing paper with tweezers and applied directly to model bases. 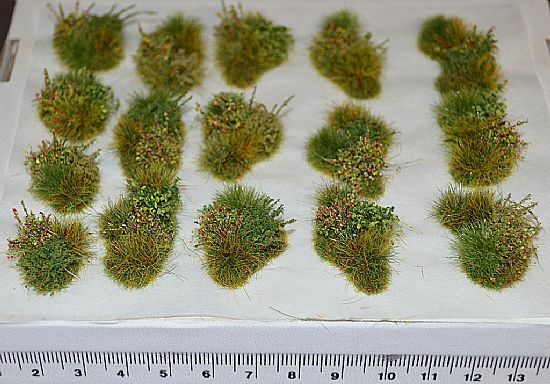 Based on Spring Mix or Moss mix Grass tuft base and incorporating a mix of grass tufts and shrubs. Instant Diorama! Picture is representative, all tufts are handmade and every pack will vary slightly in appearance. Self adhesive diorama elements.These work on the same principle as all our tufts, peeled from the backing paper with tweezers and applied directly to model bases. Based on gold fibre tuft base and incorporating a mix of larger tufts, shrubs and model rocks. Instant Diorama! Picture is representative, all tufts are handmade and every pack will vary in appearance. 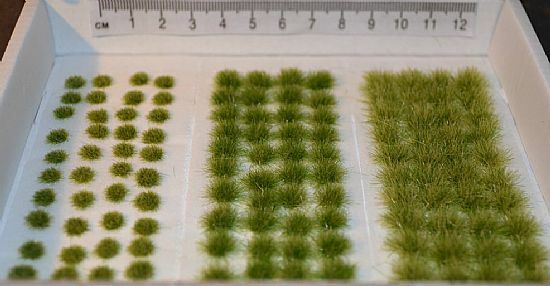 Self adhesive diorama elements.These work on the same principle as all our tufts, peeled from the backing paper with tweezers and applied directly to model bases. 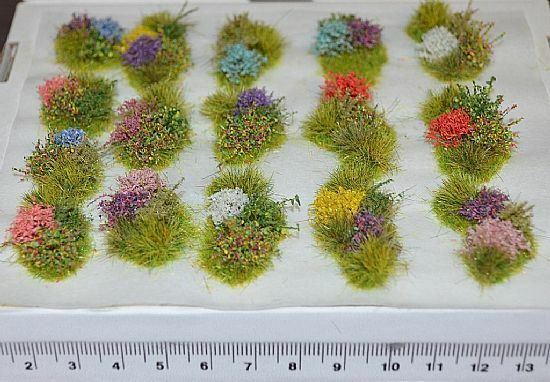 Based on Spring Mix or Moss mix Grass tuft base and incorporating a mix of flowers, shrubs and grass tufts. Instant Diorama! Picture is representative, all tufts are handmade and every pack will vary slightly in appearance. 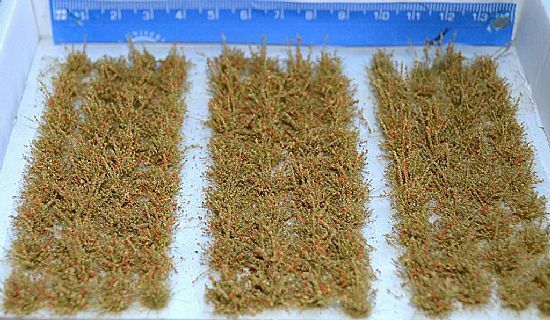 200+ short fibre (2-3mm) self adhesive Static Grass Tufts. 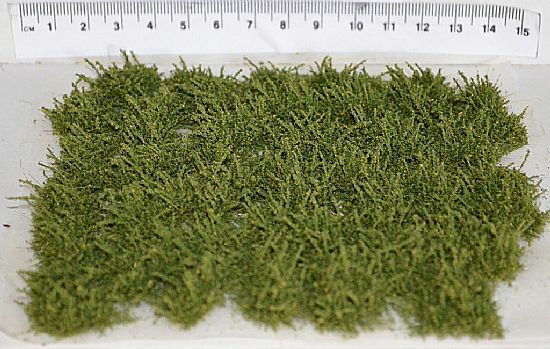 Make excellent shrubs for smaller scales like 6mm to 15mm or coarse grass for larger scales. 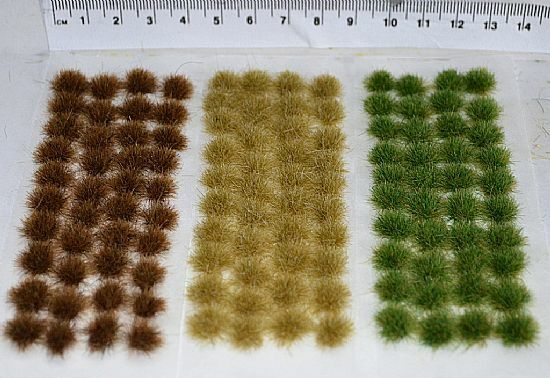 In a variety of colours, or in mixed 3 colour packs of 120 tufts (40 of each). 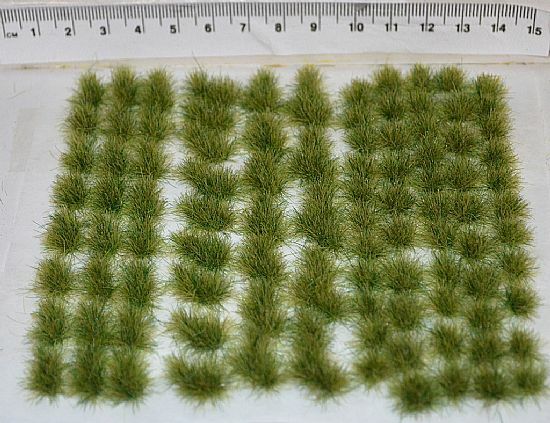 120 Med fibre(4-5mm) Self adhesive static grass tufts. In a variety of colours, or a Mixed 3 Colour pack. 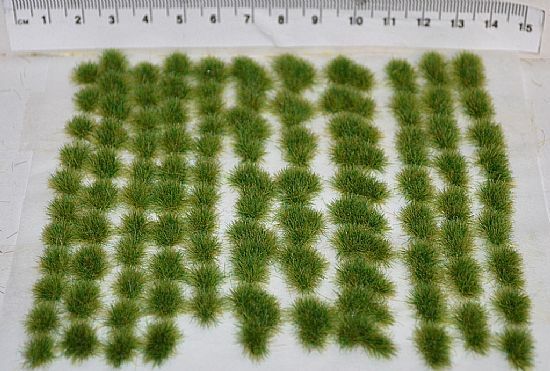 120 Longer fibre (5-7mm) self adhesive Static Grass Tufts. 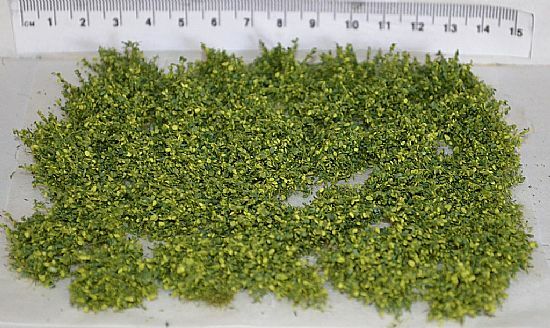 Make excellent shrubs for smaller scales like 6mm to 15mm or coarse grass for larger scales. In a variety of colours, or Mixed 3 Colour packs. By popular demand we now offer a pack with a mix of the Tuft sizes. The pack contains 3 strips each with 40 each of sizes L/M/S in either Green,Gold or Brown. 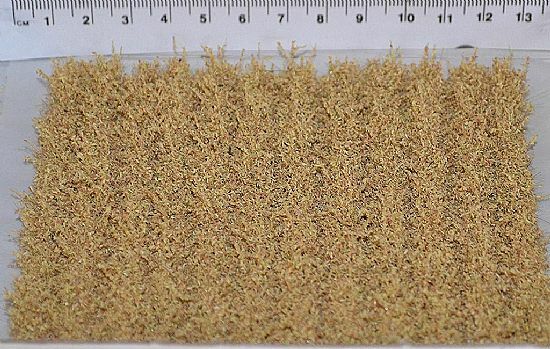 80 Self Adhesive Extra long fibre (12mm) grass tufts in blend of GREEN fibres or in GOLD. 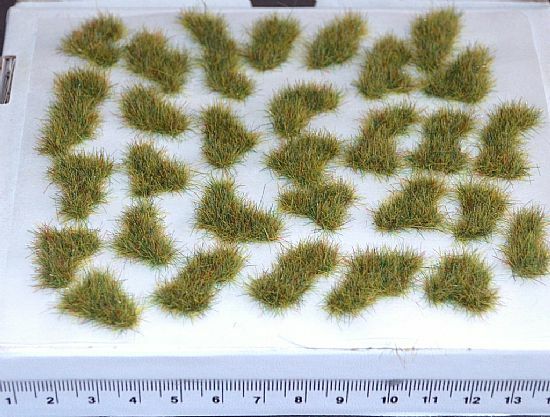 Extra large tufts are approx twice the size of our regular "Large" size and a very suitable as grass tufts for larger scales or as bushes for smaller scales. 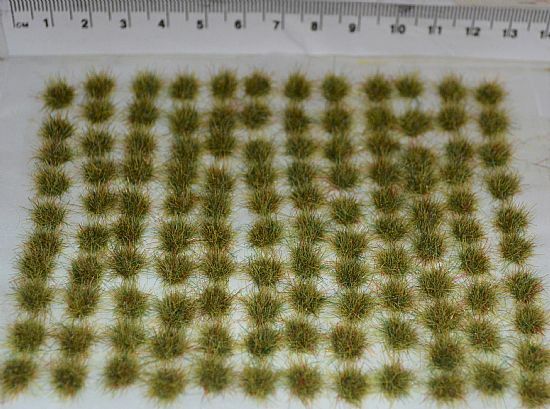 120 mixed length(2mm-6mm)and blended colour Self adhesive static grass tufts. Very natural looking rough scrub land tufts. Blend of colours makes them suitable for many applications and scenes. 10cm Grass strips. These are now self adhesive and can be cut into suitable sizes for applying to models. 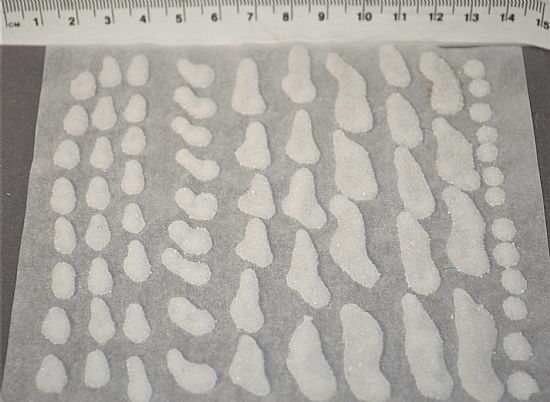 They remain very flexible, unlike similar products made using PVA adhesive. Make great grass borders etc. Strips peel easily from the backing with tweezers. 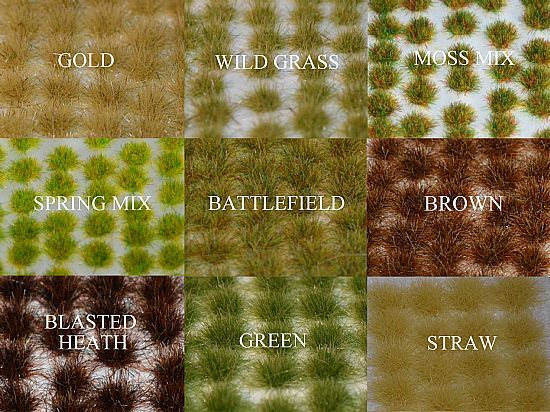 The landscape elements utilise our popular WILD grass blend of fibres similar to buffalo grass and are also available in short fibre versions in several colours . 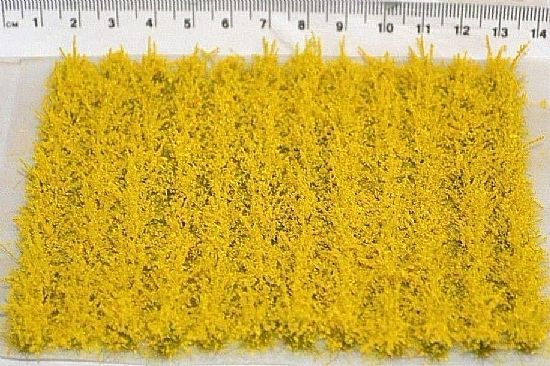 They are very useful for filling in larger areas than a tuft, superb for dioramas etc. A dab of glue may be required for a permanent fix on some surfaces. 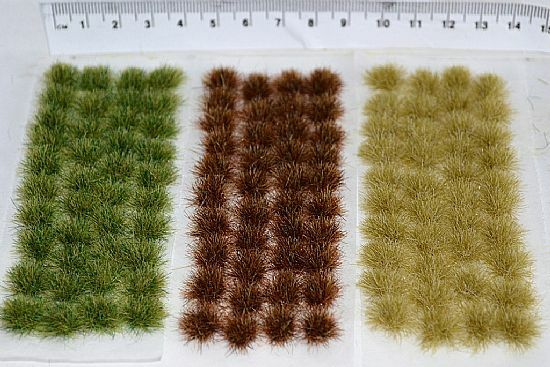 Smaller version of our popular landscape elements utilising the wild grass blend of fibres similar to buffalo grass (blend of 2-6mm fibres) or in short (2-3mm) fibre colours as listed. Organic natural shapes and a random assortment of tuft sizes, superb for dioramas etc. Self adhesive. A dab of glue may be required for a permanent fix on some surfaces. 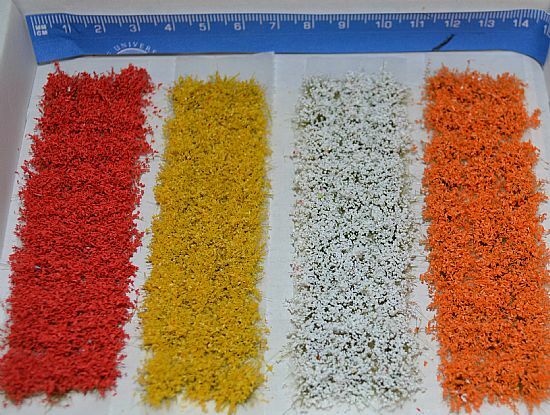 Smaller version of our popular landscape elements utilising 3-4mm Medium fibres in our range of colour blends. Organic natural shapes and a random assortment of tuft sizes, superb for dioramas etc. 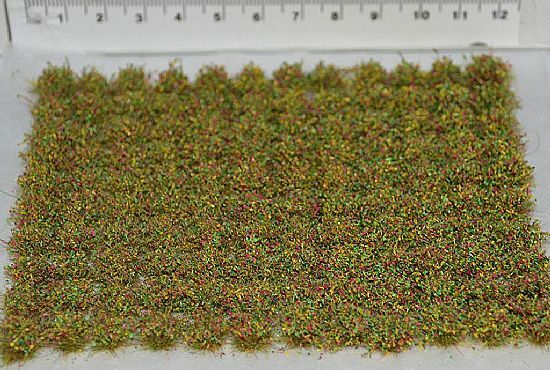 Smaller version of our popular landscape elements utilising 5-6mm Large fibres in our range of colour blends. Organic natural shapes and a random assortment of tuft sizes, superb for dioramas etc. Like the Grass strips these are self adhesive and so can be cut into suitable sizes for applying to models. Make great crop rows like beans etc. Strips peel easily from the backing with tweezers. 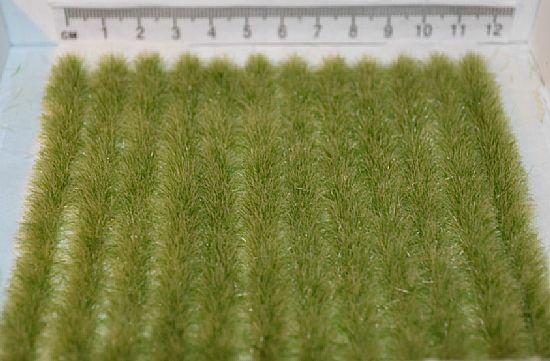 Like the Grass strips these are self adhesive and can be cut into suitable sizes for applying onto models. Make great crop rows. Strips peel easily from the backing with tweezers. Like the Grass strips these are self adhesive. 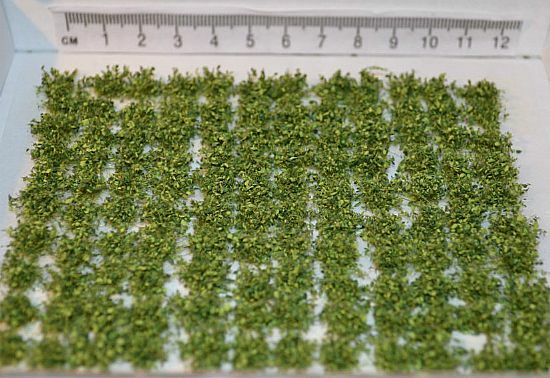 Make great crop rows or can be cut up to make smaller plants. Strips peel easily from the backing with tweezers. 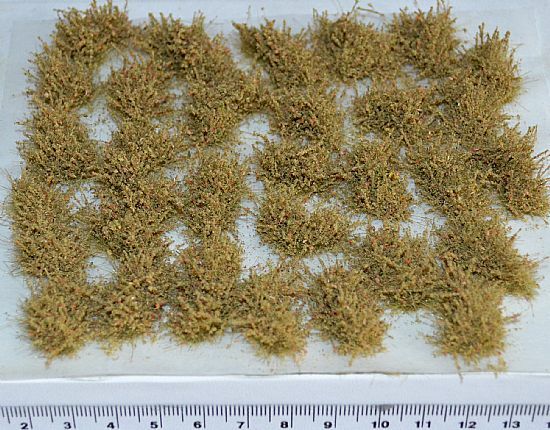 120 leafy tufts to simulate small bushes. Self adhesive. 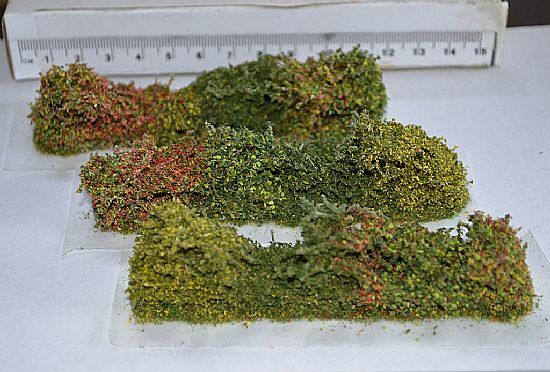 Useful for adding mixed foliage into dioramas. 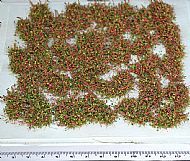 120 Small fuzzy Bushes/Shrubs to complement our leafy shrubs. In Lush GREEN,DESERT yellow or OLIVE GREEN. 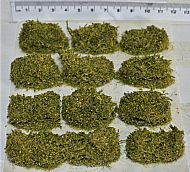 Mixed 50/50 pack includes half Lush Green and Desert Mix. 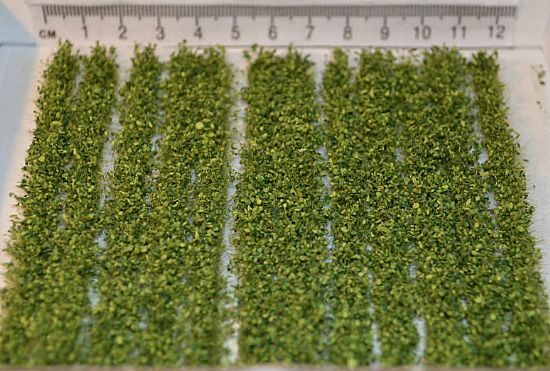 Each shrub has a diameter of approx 8mm and height of approx 10mm.Ideal for most wargame/ miniature scales and model rail layout etc. 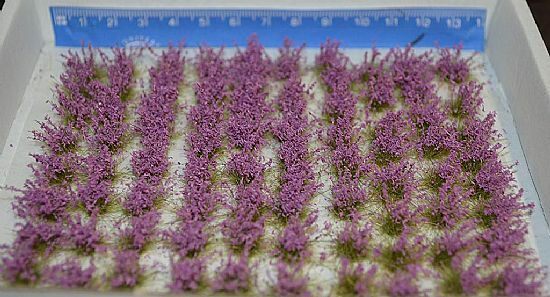 120 Self Adhesive Flowering Heather Tufts in Purple, Blue and soft Pink. Not as brightly coloured as the mixed flower pack. Also available in single colour packs. 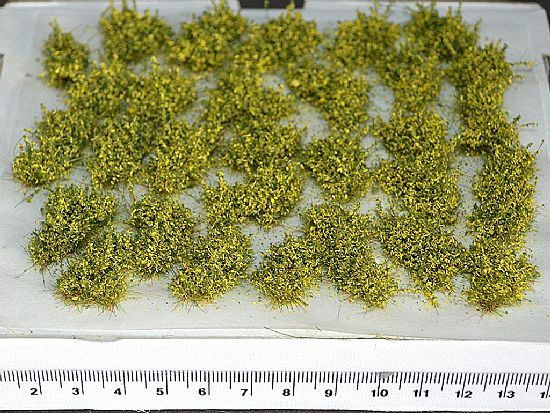 120 Flowering tufts to simulate flowers or flowering grasses. Useful as wargame unit identifiers. Also available in single colour sheets. 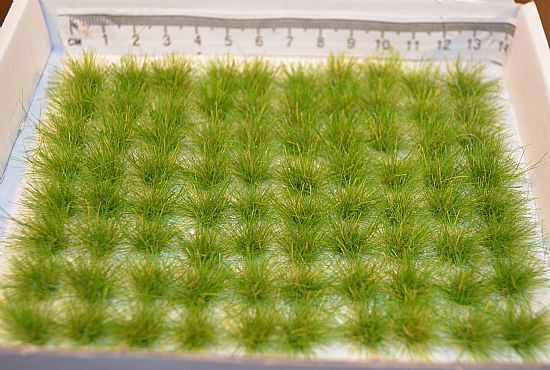 80 larger size flower tufts to simulate flowers or flowering grasses. Similar in size to our XL grass tufts. Model Gorse bushes. Superb for dioramas etc. Very flexible, unlike similar products made using PVA adhesive. Self adhesive but a dab of glue may be required for a permanent fix on some surfaces. Model Fuchsia bushes. Superb for dioramas etc. 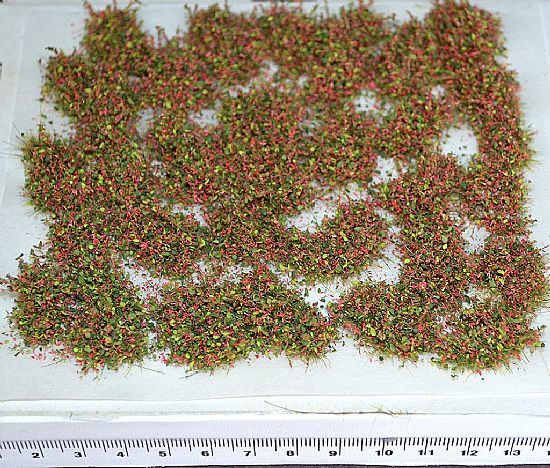 Simulates any leafy red flowering shrub or even flowers for larger scale models. Very flexible, unlike similar products made using PVA adhesive. Model Desert / Arid land bushes. Superb for dioramas etc. 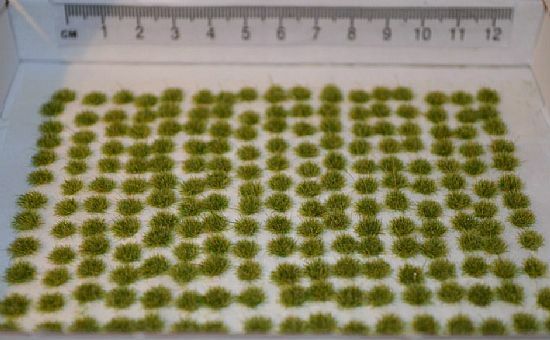 Simulates any arid land plants. A larger version of our small desert shrubs. Very flexible, unlike similar products made using PVA adhesive. Model Leafy bushes. Superb for dioramas etc. Very flexible and highly self adhesive. 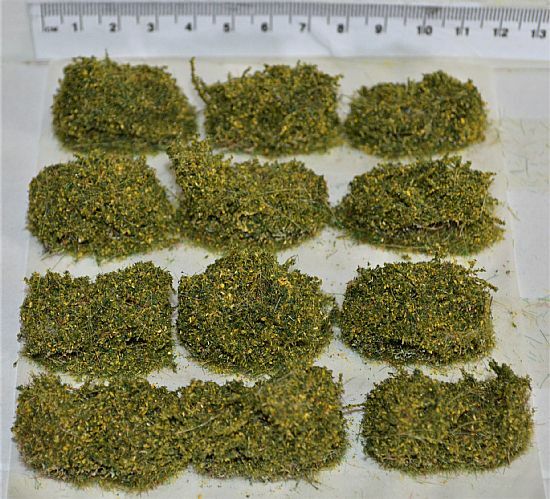 Model Green bushes. Superb for dioramas etc. Very flexible and highly self adhesive. 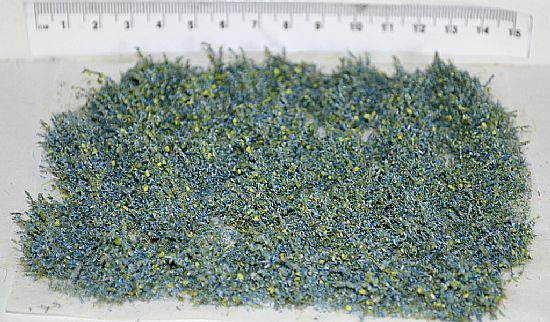 Model Blue flower bushes. Superb for dioramas etc. Very flexible and highly self adhesive. Self adhesive realistic snow pads in both the Natural elements format and the larger Landscape elements format.